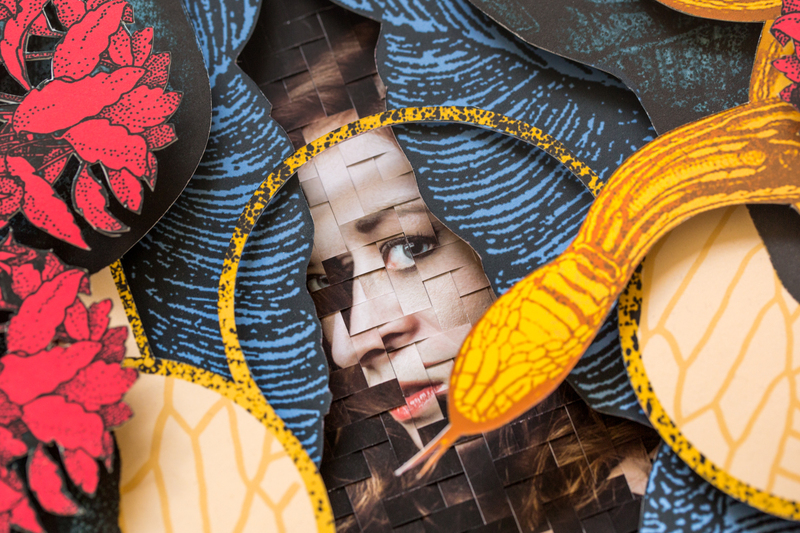 I have been a long time fan of collage art and the many ways that you can manipulate and juxtapose paper, whether it is made from maps, layered photographs, or old school from several different sources. I finally had the pleasure of seeing the talent behind two artists that I had admired from afar in person, Alex Eckman-Lawn, and Jason Chen, at this year's Art on Paper Exhibition. Separately they have unique approaches to collage art and display, Alex utilizes a layering technique along with collage art that provides depth to each of his pieces, while Jason uses multiple photos of the same subject and weaves them together to create an illusion of displaced time. Last year, they debuted their collaborative efforts showcase entitled “Asynchronist” and now they continue to blow me away with their latest series. Enjoy! If you are looking for something to do today amongst all of the amazing art shows on this weekend in New York, I have just the thing for all paper enthusiasts. Be sure to stop by Art On Paper Exhibition at Pier 36, Paradigm Gallery + Studio - Booth E1. They will be showing four artists that I think are a must see. In order above from left to right, Charles Clary, Seth Clark, Kelly Kozma and Alex Eckman-Lawn. There is a range from cut paper collage, mixed media paper reliefs, to hole-punched paper and photographs forming new pieces. You have until tomorrow, so be sure to swing through! 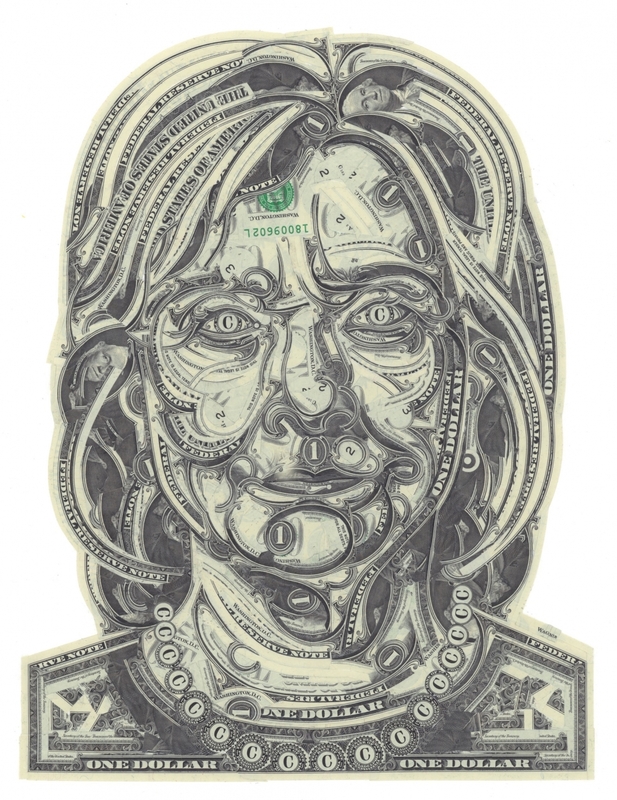 Meticulously handcrafted using small pieces of U.S. one dollar bills, New York based artist Mark Wagner’s currency collages reconfigure the familiar green-and-black-printed paper into fantastical garden scenes, strange creatures and US politicians past and present. In addition to showcasing the uncanny precision for which Wagner is known, the collaged illustrations express poignant criticism of our addiction to money. Sylwia Kowalczyk is a Polish artist currently based in Edinburg, Scotland who has created a collection of collages and portraits from her own archival images entitled ‘Lethe’. Each print within these compositions has been carefully juxtaposed, revealing new and surreal forms touching on the theme of memories. 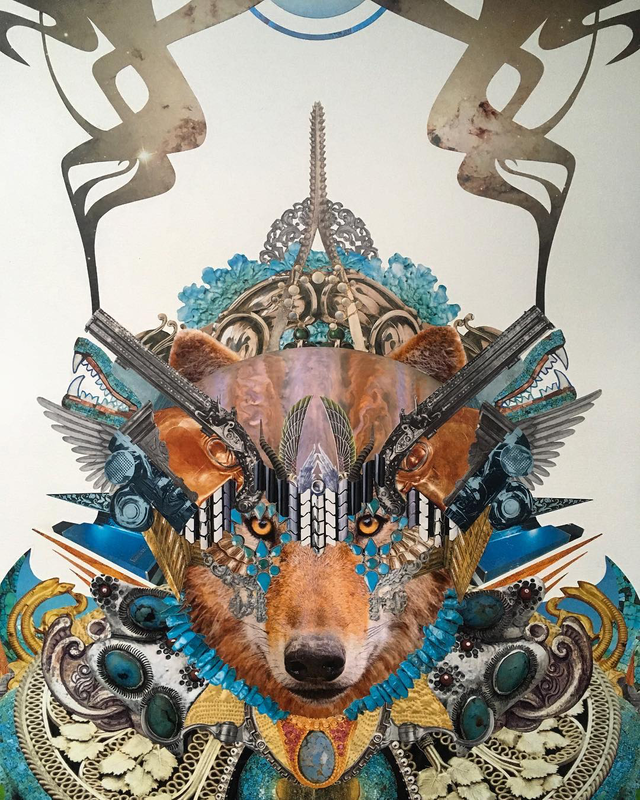 The animal kingdom takes new shape in these psychedelic collages by Vancouver based artist Jacob Intilé. I stumbled across his Instagram sometime ago and was wowed by how he is able to capture the seriousness of each creature as we realize them in nature, yet give them new depth in their collaged transformations, as if they are kings or emperors from another dimension. These ornate and otherworldly costumes all use of symmetry as an underlying theme throughout, using parts other creatures from the animal kingdom and nature, such as butterflies, or bouquets of flowers in the final construct of the these galaxy derived creatures. A multimedia artist working in collage, painting, and book art, Texas based artist Matthew Cusick is best known for his map collages comprised of intricate, warmly colored portraits and landscapes, or even previously his immensely detailed portraits. “Maps have all the properties of a brushstroke: nuance, density, line, movement, and color,” he says. 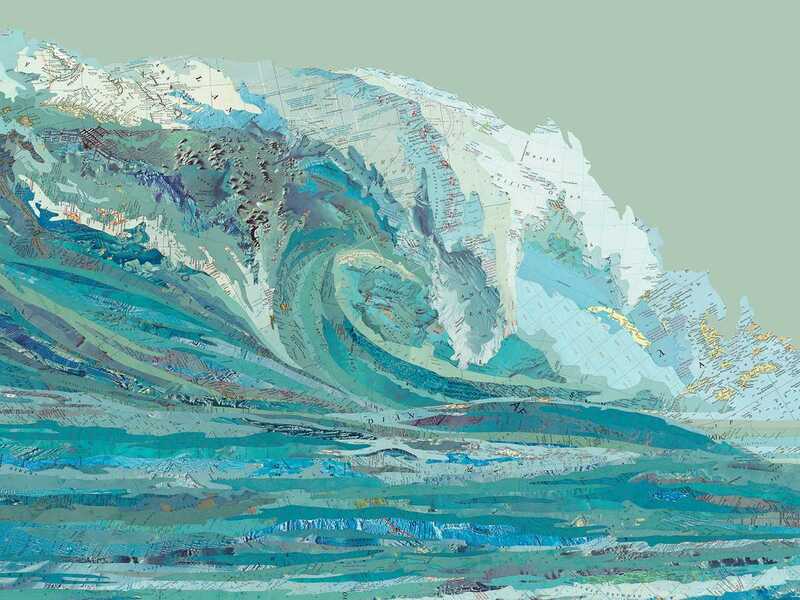 “Their palette is deliberate and symbolic, acting as a cognitive mechanism to help us internalize the external.” These collaged waves are formed from various found maps and placed like a puzzle, simulating the roaring movement of breaking swells, sometimes massive, rising up and crashing down with graceful force, each unique with their own thrilling capacity to draw you inward. California native Elise Wehle studied art at Brigham Young University in Utah, but found her calling and understood the type of art she wanted to create after living in Spain for a year. Surrounded by the patterns that cover Andalucía, Wehle began using similar patterns within her own collages. Yet, it was the Alhambra, a Moorish palace covered in intricate, hand carved patterns, that influenced Wehle the most. 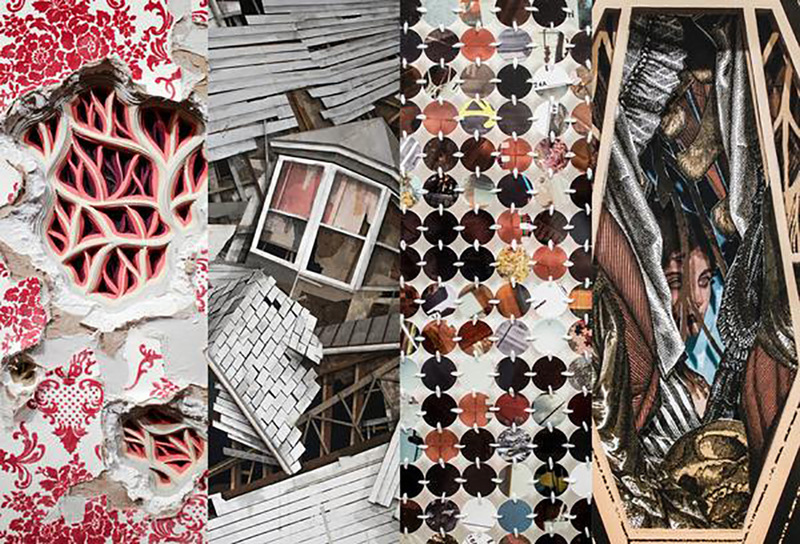 These hand-cut paper designs are comprised of layers of an assemblage of mixed media, transforming the images into distressed and textured compositions. She states, "It's not surprising then that after I saw my first cut paper artwork, a beautiful piece by Donna Ruff, I knew I needed this process in my creative life. It represented that human presence, imperfect but dedicated, that I admired so much in others' work. 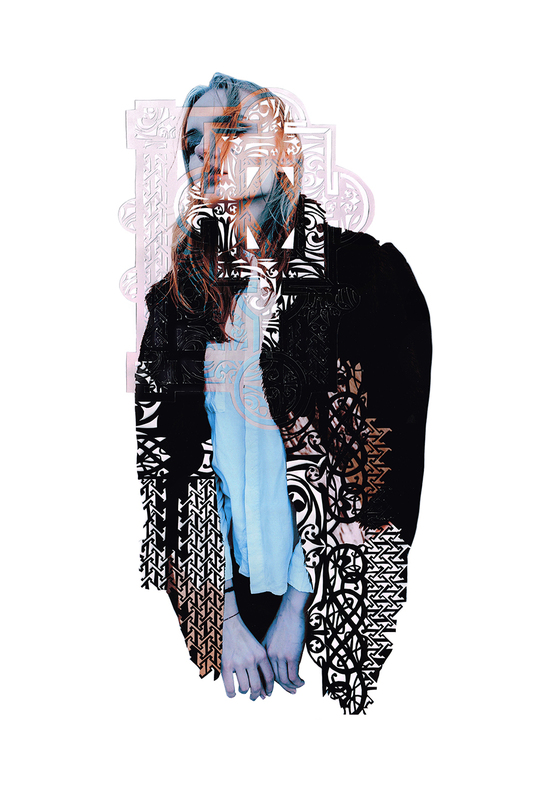 I started experimenting with cutting paper soon afterward." The moodiness of each person is captured with each defining slice, as if windows to each subjects soul. New York based artist Ryan Sarah Murphy creates abstract, sculptural collages using found and collected cardboard and book covers, which are then recycled and transformed into contemporary works of art. Though these abstract paper reliefs appear to be painted, however they are completely altered as is. 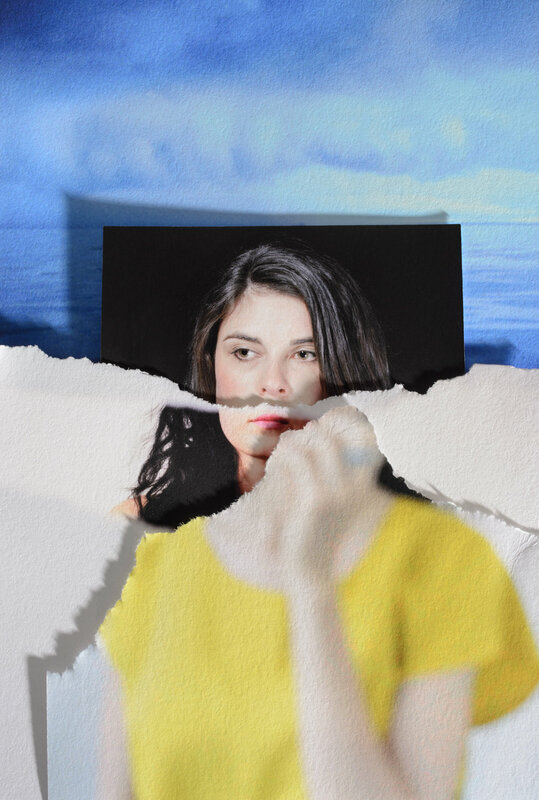 Ryan Sarah's artistic practice generates from a wholly intuitive place, prompted by the materials that come and go freely within her day-to-day experience. 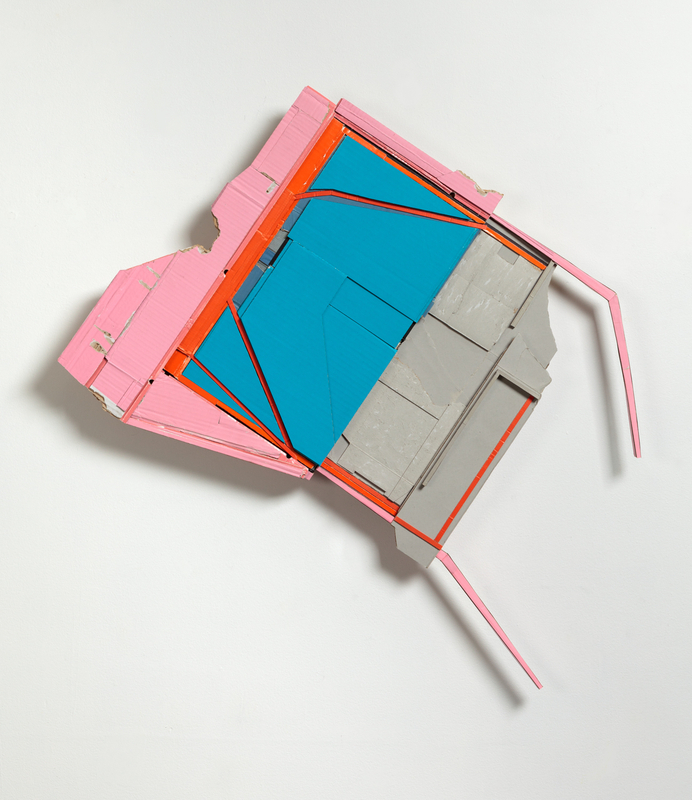 As a compulsively overlooked throw-away, the artist is rather interested in the way the simple, abundant and inherently impermanent materials can be structured into quiet surfaces that convey both formation and dilapidation simultaneously. Her work is currently on display at the Odetta Gallery in London through December 18th, 2016, in a series entitled Bauhaus babies, alongside Richard Bottwin and Sylvia Schwartz. The exhibition, curated by artist Ellen Hackl Fagan, aims to focus on the special interest given to contemporary painting, glyphs, music, Color Field, Buddha Mind, Minimalism, playfulness and encyclopedic obsessiveness. Award-winning graphic designer Jeremy Grant is an emerging artist born in California, currently living and working in Denver, Colorado. 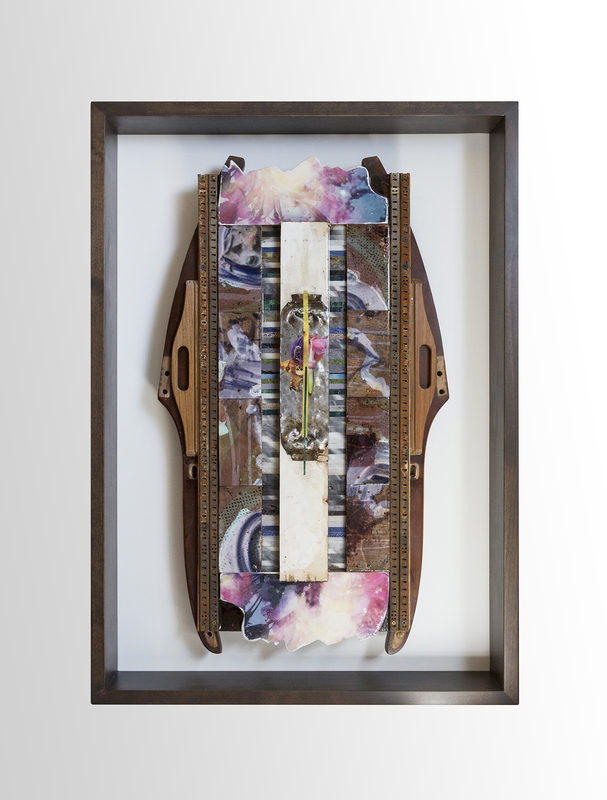 Focusing on mixed media collage, with strips of paper and photographs, and the utilization of the assemblage of found objects, his body of works explore the themes of destruction & creation, death & resurrection, and chaos & familiarity. 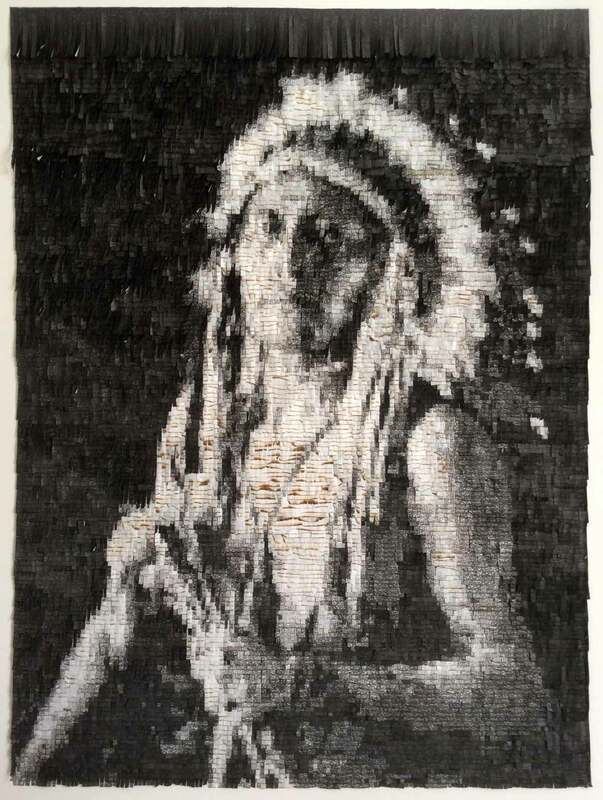 After breaking down his materials he brings them back together, pairing the items in unexpected ways and transforming these discarded, disconnected objects into assembled pieces of art, where he likes to think of this as creating new life out of destruction.